What is the worst service call you can possibly receive? In my mind it is the infamous ground fault on a fire alarm system. These can either be a quick fix (pending it's locked in and you are familiar with the circuit pathways) or a very time consuming correction. If the ground fault is minuscule due to compromised wire insulation, water or vibration causing the ground fault to swing in and out, you could potentially be looking at a long day. Note there are two types of ground faults. An absolute short to ground is caused by a portion of the conductor touching a solid earth ground. This is the case with pinched our cut insulation, wires stripped back to far, strands of your conductor poking through tape, etc. In all these cases, the actual copper of the conductor is touching physical ground. The other form of ground fault is commonly known as a "soft ground fault". These faults are typically caused by moisture or compromised insulation where the copper is not necessarily touching ground however the insulation/voltage threshold is lowered and can be the cause of a ground fault. Water can also be the cause by penetrating the insulation through hairline fractures and bridging the gap between the copper and ground. A fire alarm control panel uses an internal 12-24 volts DC to seek out ground faults on all connected circuits including power, SLC, IDC and NAC. Most ohmmeters used for troubleshooting fire alarms systems have an internal battery with an output voltage of 1.5 - 3 volts DC (In the picture below, you will notice the analog ohmmeter I am using for this article puts out 1.628 volts DC). In cases where the insulation/voltage threshold is below 12 volts but above 3 volts, the ohmmeter will not detect the ground fault. If the ground fault does register on the ohmmeter, it will show some conductance to ground where a clean circuit will show infinite ohms or an open circuit. With a soft ground fault present on the conductor, the ohmmeter will show a reading in the range of high K-ohms (K) or Meg-ohms (M). Note the fact that these readings can be unstable and hard to decipher if the technician is not completely seasoned and experienced with their multi-meter. The solution to quickly locating a soft ground fault on a fire alarm system. In order to locate a soft ground fault as easily as the fire alarm control panel, we will need a ohmmeter that has a slightly higher output voltage than the factory range of 1.5 - 3 volts DC. This higher voltage output will allow you to locate the source of the ground fault more quickly and accurately saving you a great deal of time in the field. Once you know what conductor the ground fault is on, you can use the industry standard of breaking circuits in half until the fault is isolate to its source. 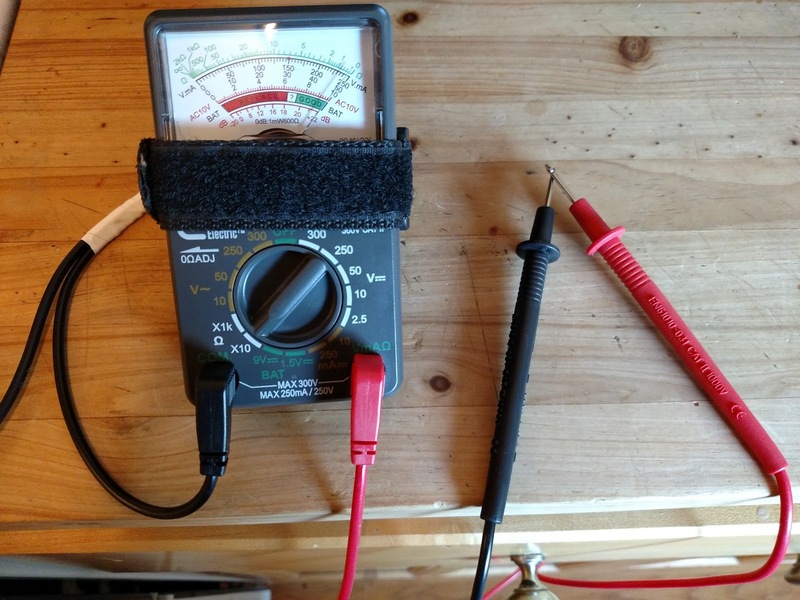 How to build your own high voltage output ground fault detection meter. Below I have outlined step-by-step instructions on how to build your own ground fault meter using materials found at any hardware store for around or below $30.00. 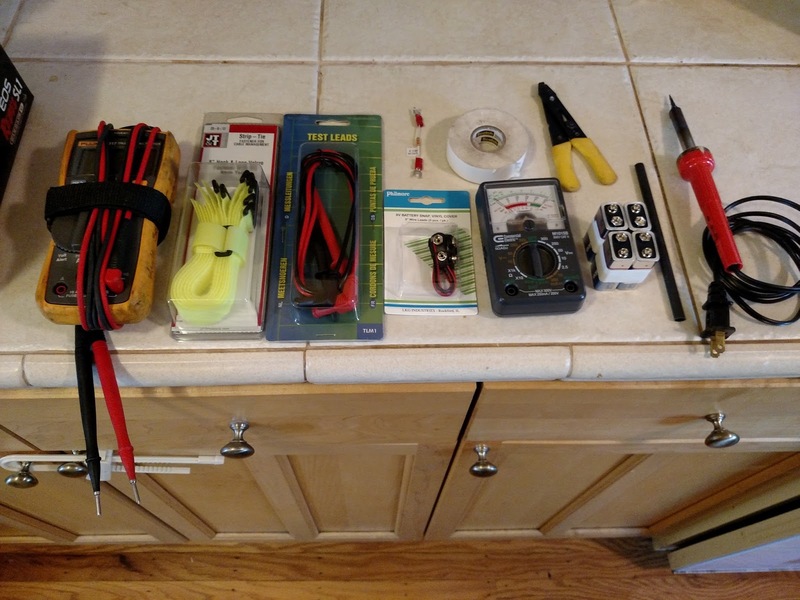 Lets get started with the build! Use your digital multi-meter (set to read current) to take a current draw of your analog ohmmeter. To be more detailed, you need to find out the current used by the analog ohmmeter to read exactly zero Ohms or a dead short. Move your positive test lead on the digital multi-meter to AMPS and turn the selection dial to DC Amps. Now place the two test leads of the digital multi-meter into the test lead ports of the analog ohmmeter. When done correctly as pictured below, your analog ohmmeter should show zero Ohms and your digital multi-meter will indicate the amps needed to show true zero. In the picture below the digital multi-meter shows a reading of 0.016 Amps. Remember this number for determining the limiting resistor value in step #3. In order to achieve the higher output on our new analog ohmmeter, we will be using the four 9 volt batteries in series. Remember when batteries are connected in series the voltage doubles and the Ah remains the same. 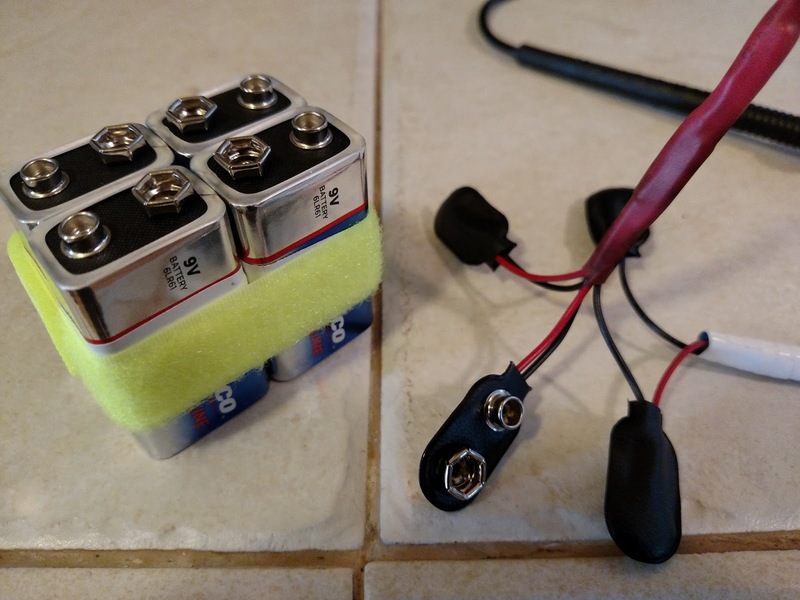 So in the case of four 9 volt batteries in series, we will achieve 36 volts DC. 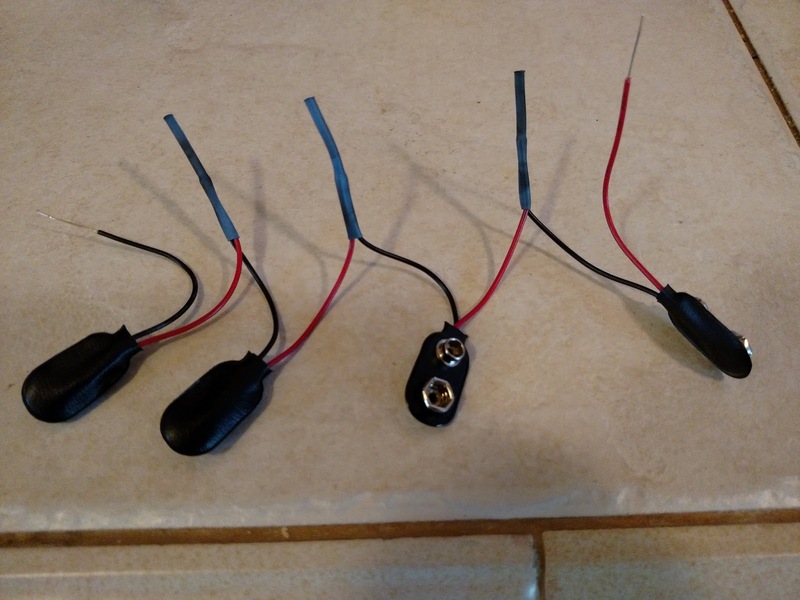 Start out by stripping and connecting the four 9 volt battery connectors with flying leads in series. Once connected, I highly recommend a solid bond via solder finished off with a clean heat shrink tubing. See the below pictures for examples. 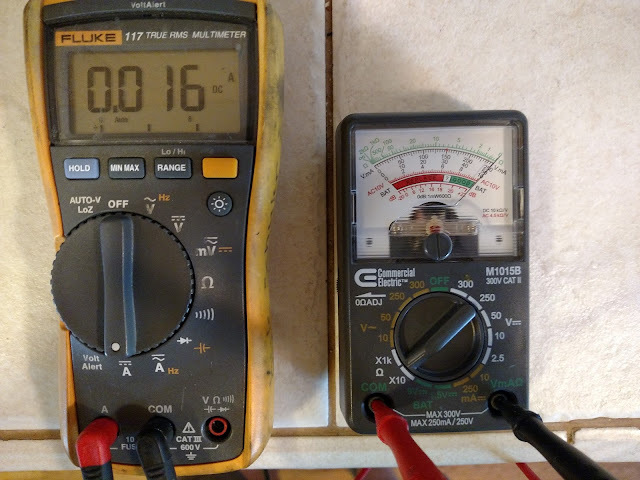 Now that we know what amount of voltage we have with our four 9 volt batteries in series (36 volts) as well as the current used to read absolute zero on the analog ohmmeter (found in step #1), we can use Ohm's Law to determine our limiting resistor value. Ohm's Law states that E (volts) / I (current) = R (Resistance). In this case 36 volts / 0.016 amps = 2,250 or 2.25K. 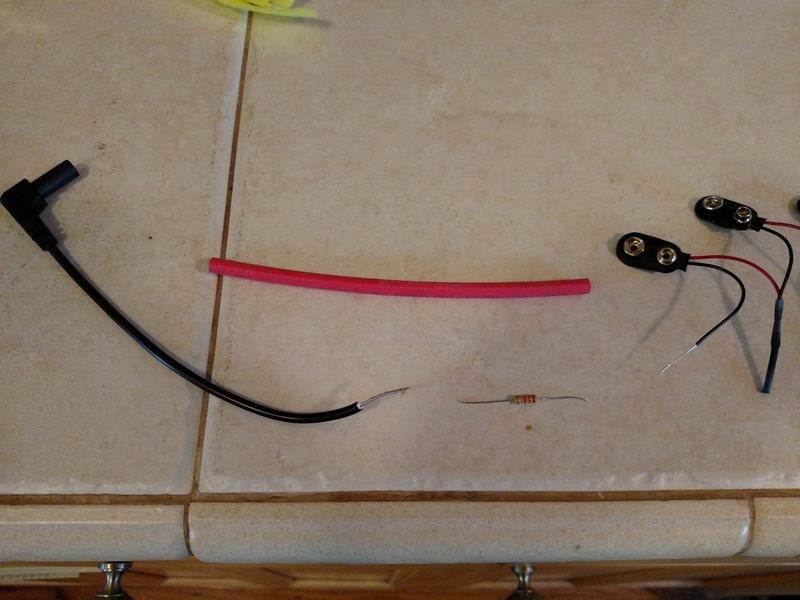 For the purpose of this article, I will be using a 2.2K resistor. When you attempt this project, you may need to slightly increase/decrease the value of your limiting resistor in order to read absolute zero. Remember, lower value resistors will move your analog ohmmeter needle closer to the right (0 ohms). We will now need to insert this limiting resistor in series to the negative test lead of our analog ohmmeter. I recommend cutting the negative test lead 5 - 7 inches away from its meter connection side. 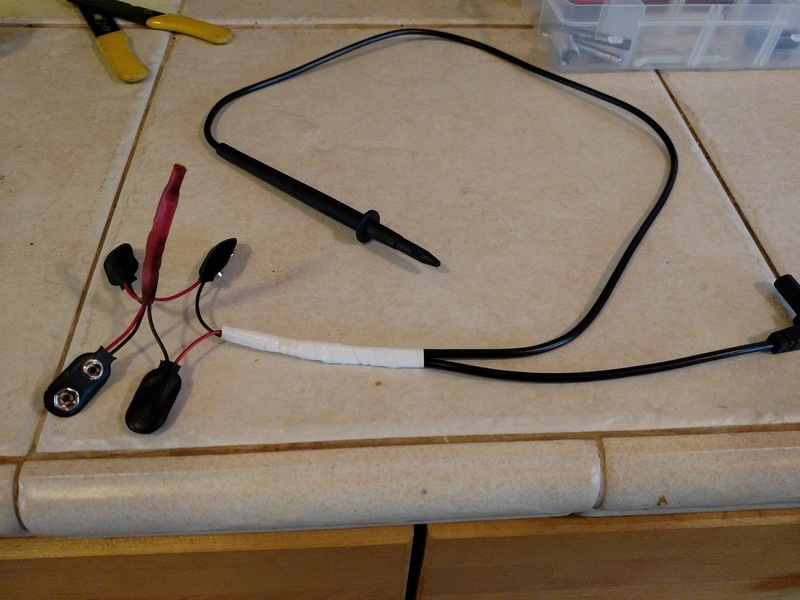 Once the lead is cut, splice the resistor in series, solder the connections and finish off with heat shrink tubing. IMPORTANT, make sure the limiting resistor is placed between the analog ohmmeter and the 36 volt battery connectors. See below picture. 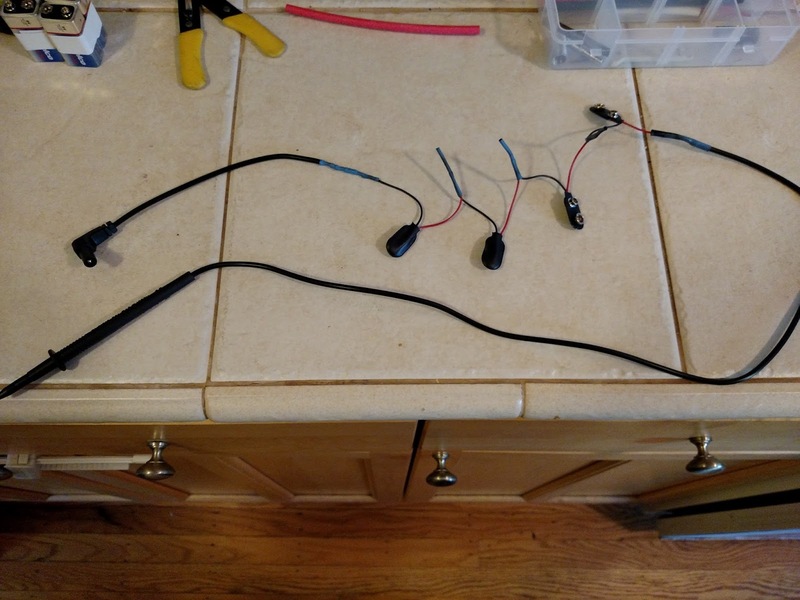 This next step is preference as you can clean up the wire connections anyway you see fit. For this article, I just taped them up. Once you get your ground fault meter built, you will want to play with some different ideas that will insure longevity and ease of use in the field. 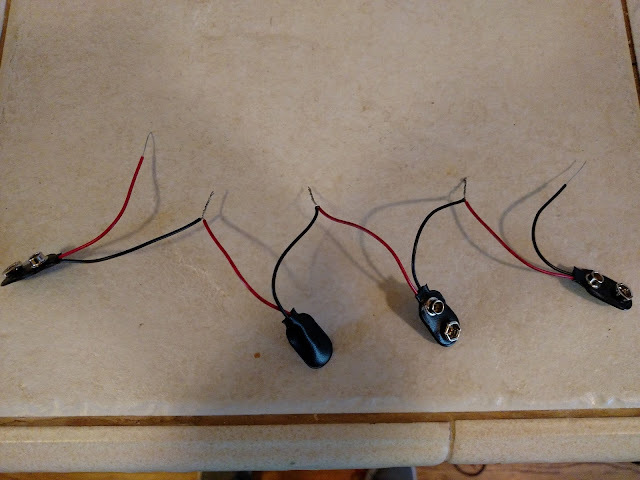 With the negative test lead disconnected from the analog ohmmeter, connect all four of your 9 volt batteries to the connectors. Once connected, use your digital multi-meter to verify 36 volts insuring your connections are correct. Now that you have verified the correct output voltage, connect the negative test lead to the analog ohmmeter. With the ohmmeter set to Ohms, short the test leads together. You should get absolute zero. In the picture below, I have the 36 volt battery pack Velcro strapped to the back of the analog ohmmeter. You will see both test leads are shorted and the ohmmeter is reading absolute zero. The picture below shows the new output voltage once your fire alarm ground fault tester is complete. 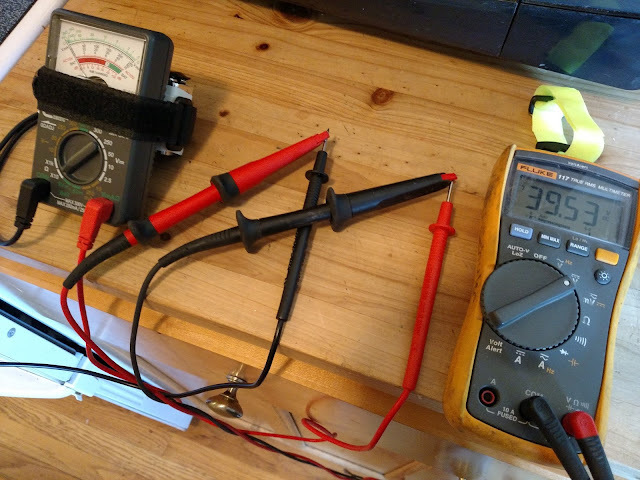 If you remember from earlier in the article the original analog ohmmeter put out 1.628 volts DC whereas the new setup is showing 39.53 volts DC. This 39.53 volts is a combination of the 36 volt battery pack as well as the internal battery within the analog ohmmeter. 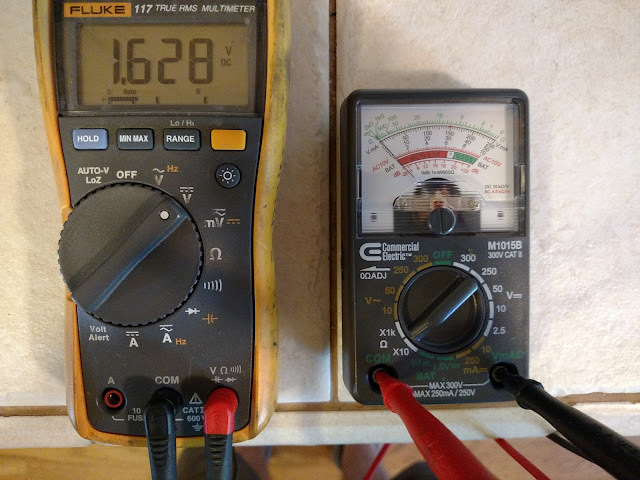 This higher voltage will make locating a ground fault a lot easier as well as increase your accuracy tenfold. Also note the output voltage is still low enough to not damage devices and appliances on fire alarm circuits. Make sure when using this tester, you disconnect all circuits from control boards. To locate a ground fault, look for continuity to ground on each circuit. This new analog ohmmeter will show infinite ohms when the conductor is not exposed to an earth ground. If the insulation is compromised and/or the copper is directly connected to ground the ohmmeter will indicate 0 ohms. If a soft ground fault is present, the meter will fluctuate from infinite (left) towards zero (right). This fine movement should allow you to track down circuits with faults in half the time. Good luck with your build and be sure to let us know if this new fire alarm circuit tester helps you in your daily troubleshooting. Make sure to join our Facebook page and let us know your thoughts.